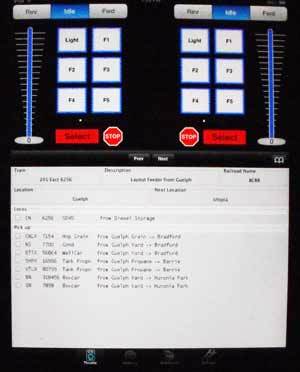 WiThrottle is an app that can be downloaded from the Apple iTunes store for model train control. There's a free version but the full featured version was only ten dollars so I opted to go whole hog. John set me up so I could interface with his system and use my iPad through his server at his house. You can see on the screen in the full version that there are two throttles so you can run two trains. John uses Digitrax (while I have Lenz at home) so the iPad will work in tandem with the Digitrax system when I'm operating on his layout. You could also use an iPod but the screen image would be smaller and probably only one throttle should be chosen. We're going to see if the iPad mini would be easy to use. [I now use a mini and other operators are using different tablets or smartphones]. The full featured version, as you can see on the screen below, allows the operating schedule for the train's pickups and drops to be displayed below the throttles. Tapping on a station name, in this case, Utopia, brings up the pickups and drops. Tapping on a pickup or drop will put a tick mark so you know you have completed the movement. The information from the conductor screen can be transferred to the main program within jmri by tapping on 'move' after ticking off all drops and pickups (see below for an example). 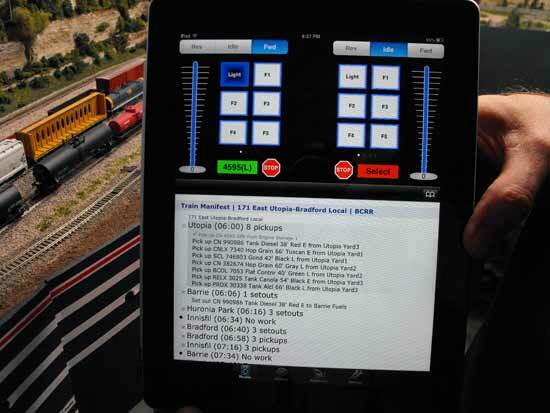 We've done a lot more experimenting with model train control using the WiThrottle app and the jmri operations software . John has been tweaking the system and has worked closely with jmri to introduce improvements. It is now very sophisticated. We had to learn how many operators could conveniently move around the aisles and how the schedules worked in practice. We also had to become familiar with the layout and the Tam Valley turnout diagram for the mainline and sidings for the industries. John had done a marvellous job of labelling the fascia so we were able to pick it up pretty quickly. We also had to get used to uncoupling N scale freight cars instead of HO cars. John flattens the tip of micro paint brushes and I found that they made it easy to uncouple the cars. I still had some trouble reading car numbers but he had included descriptions of the cars on the manifest and that helped a lot. Having both the throttle and the manifest on a tablet is certainly more convenient than juggling a throttle and car cards or pieces of paper. He has added holders that permit the iPad to be placed on the fascia or temporarily secured. John based his layout on the real Utopia and Barrie region of Ontario while my Utopia Northern is pure fantasy. Utopia is just west of Barrie on the way to Angus. I hope to have my new railway up and operating by 2016 so we can resume sessions at my house. 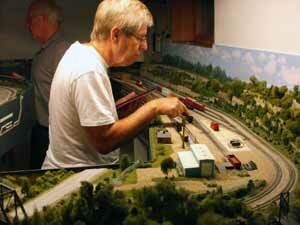 I'll post more about our experiences with electronic model train control in the future. Meantime our club President, Martin Alborough, has been learning the jmri operations software and we plan to install it on our new club layout being built at Bygone Days in Collingwood. 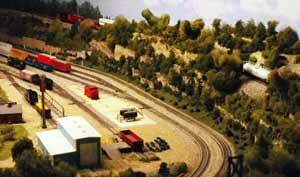 We had our first operations sessions on John's layout in 2013 to try out the schedule. Martin Alborough brought his wife's iPad mini to see how that would work size-wise compared to the larger iPad that I had brought. Martin worked a series of four short local trains with John guiding him while I introduced Andy Durie to the layout. We operated the Guelph Feeder that works around the entire layout. It took us about two hours to make the run. 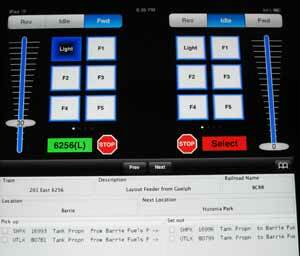 I handled the iPad while Andy acted as conductor planning switch moves and operating the turnout controls. There is a 15 mph speed limit in the yards and 5 mph for coupling. There are yard limits that must be respected when switching. Locomotives on the mainline are speed-limited within Decoder Pro to simulate the prototype's characteristics. We ran below the speed limits on the mainline because we were unfamiliar with the route. Follow along as I explain how this all works with jmri software. The overall manifest screen and schedule shows all trains. Andy and I were working the one at the bottom, 201east from Guelph. Next is the "conductor" screen that shows pickup and drops designated in the program as "moves". Ticking off these updates the computer, (in John's case it's a Mac) so that moves are tracked in real time. You can toggle back and forth between the manifest screen that shows more information and the conductor screen that only shows the moves for that station. 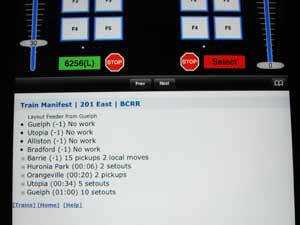 The main computer is not updated if the main manifest screen is used to keep track of the moves. The update would need to be done manually after the session. It was easy to use the manifest screen to find the cars that had to be moved and then toggle to the conductor screen to do the moves and tick them off. The schedule for 201east shows the station order and the workload. We could tap on any station/location to see what had to happen when we arrived there. This helps to plan where cars should go in the train. 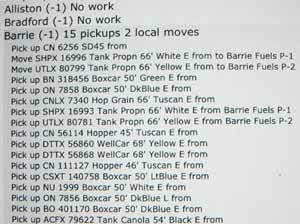 For example, as you will see shortly, the two propane cars needed to be at the end of the train to make switching at Barrie easier while the two boxcars were better placed at the head end of the train for eventual drop off at Utopia Yard. Once Andy and I were satisfied with how to switch a location I would advance the train towards the next station. It is simple to check the manifest status for a train by toggling to that screen. The last box at the right shows that the train is en route and gives the number of cars and the tonnage being hauled. Neat! Taking one station as an example: When arriving at Barrie we needed to drop the two propane tank cars at the end of the train and pick up two empties. There was another tank car (the red one) that had to be moved and replaced after switching. Here is the Barrie switchlist. Lines 2 and 3 show the drops at Barrie and lines 6 and 7 shows the pickups. 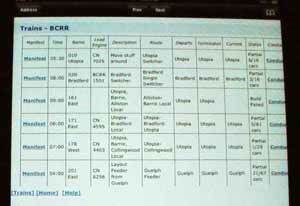 Below is the conductor screen for Barrie. It only shows the work to be done: drops and pickups. This is the screen that needs to be ticked off after the moves are done. Note that the throttle shows the locomotive assigned to our train (SET via Digitrax) is the SD-40 CN6256. The train is approaching Barrie on the mainline at 30 mph. The sidings at Barrie. Andy is holding the iPad throttle. We needed clearance to hold the mainline briefly while we switched Barrie because our train was too long. John was allowing us some liberties! We will have to break the train and park some of it in a siding next time. Martin working the Utopia yard with an iPad mini. While Andy and i were working 201east, Martin was doing some local moves in Utopia yard. John is standing behind him to give guidance. Martin was using the free withrottle app so he had to toggle to the browser to check his manifest screen and he only had one throttle. I had the full version that has two throttles. When we worked Utopia, the last stop before returning our train to Guelph, we used a local switcher on the second throttle to work our train from the rear to get a tank car into a yard track not reachable from the head end. 201east heading for Guelph behind and above Utopia. 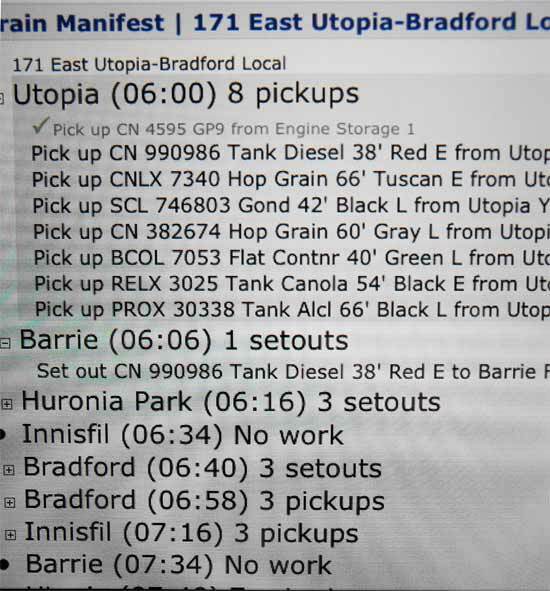 While Martin was working in Utopia, 201east is taking the high line above Utopia as it heads home to Guelph. Once we arrived at Guelph the train was terminated. This information is "moved" to the main program on the Mac to update the schedule status. The main yard at Guelph is under construction so we only had to back down the mainline. Eventually the Guelph yard will be a major originator of traffic. Utopia is a small yard halfway around the layout. The aisles are a little narrow so we have to plan ahead for where and when we have to pull our stomachs in! It has taken John a lot of time to learn and set up. His layout functioned flawlessly. We only had one derailment. A long well car didn't like backing up the train on the curve into Barrie. It caused the car behind to derail. John's trackwork is as excellent as his electronics. John has designed his own variation on Paisley's circuits and has CT detectors and a number of infrared detectors constructed. He designed the boards on his Mac and had the boards manufactured for him by a company that pools orders together. Cost is by the square inch used. 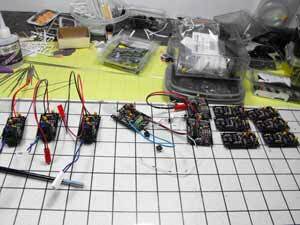 John then sources the components and populates the circuit boards. Here's a closeup of the CT board he has designed that senses current being drawn by a locomotive or car. It works extremely well. The layout is divided into occupancy blocks. John is preparing for signals. 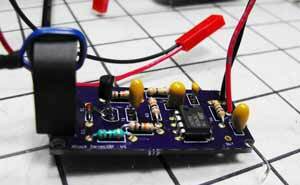 John has designed a board to operate trackside searchlight signals. He is making his own N-scale signals. I have enough trouble working in HO scale. His work is amazing. John is far more advanced than I am when it comes to electronics and he has been helping me install servo turnout control and signals using Tam Valley electronics and his own designed signal boards to mimic the indications on the panel on a signal bridge spanning the mainline. Have a look at my other pages for more details. Click on the links above. Other pages of interest are listed below. I've added another video following train 612 East around the layout now that all his track was in. John is continually adding scenery and buildings as well as experimenting with the electronics. 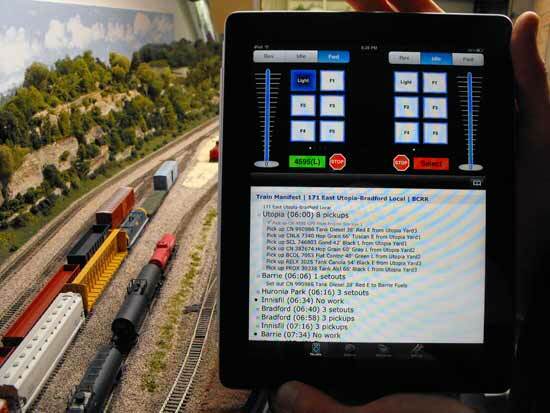 Go from "model-train-control" to John's work with jmri software. Go from "model-train-control" to DCC overview. 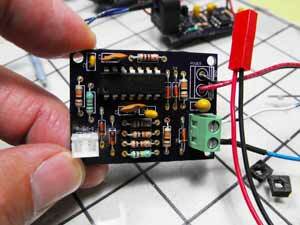 Go from "model-train-control" to DCC turnout wiring. Go from "model-train-control" to model railroad wiring. Return from "model-train-control" to my Home Page.